Original London Cast, 1982 (JAY) No stars; not recommended. It took Destry Rides Again almost a quarter-century to get from Broadway to London. 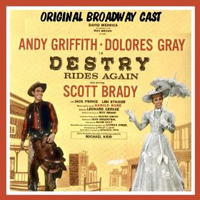 In the interim, the musical theater had changed greatly on both sides of the Atlantic, so it’s not surprising that what used to be a show with lots of dancing girls, prostitutes, and cowboys was downsized. The London cast of 19 had only three women, which meant the deletion of “Respectability. ” Almost all cast members doubled as the show’s band; the orchestration is reduced to what sounds mainly like guitars and violins with a bass, harmonica, trombone, and a barely audible piano. This approach has a calamitous effect on the score, and musical director Chris Walker must take at least some of the blame for it. 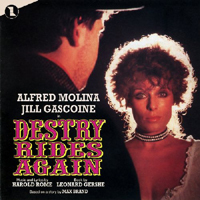 Alfred Molina is low-keyed and ineffective as Destry, while Jill Gascoine sounds pained as Frenchy; her singing grates on the ear, and she only partly compensates with her acting. Harold Rome wrote a wonderfully tuneful score for this show, but this recording manages to disguise that fact. — J.D.